Each of the Four Sacred Seasons: Spring Equinox, Summer Solstice, Autumnal Equinox & Winter Solstice, Lady Lyndy presents for your viewing pleasure answers to your questions received through blogging comments &/or email preferably on collecting & selling Halloween & Black Cat OOAK Art Work. * Leave a Comment on this post. * My black cat Magick will be picking out the winner as I will be sprinkling cat nip on all the entries. You have until Halloween Night when the lucky winner will be posted after Midnight Pacific Time. CROSS PROMOTION 101* The winner not only receives The Munsters Postcard but gets a promotional back link to their Blog. ALSO WANTED TO ADD THAT THE FANCIFUL TWIST HALLOWEEN PARTY CELEBRATION WAS A BLAST!!! * LADY LYNDY SORCERESS OF LIGHT is an advice column on COLLECTING ORIGINAL ONE OF A KIND FANTASY BLACK CAT ART WORK, HELPFUL TIPS ON KINDRED TOPICS & PROMOTING POSITIVE REINFORCEMENTS. Just flying in to see the festivities! Looks like a bloody ol’ time! Off I go with my broom! Vrrrooom! follow me to another party! Happy (almost) Blogaversary and Happy Halloween!! The witches brew sounds delicious! I may have to make that for my party. Love the Munsters too. Wish they'd put it back on TV. Great 1st party post & giveaway Lyndy!!! WOULD LOVE to win that Munsters PC. Your blog is very festive Lyndy! Wow, so much sparkle and fun :) It certainly caught my eye.... Yes, enter me into your vintage postcard giveaway - I used to watch the Munsters everyday as a child!... Maybe your dear kitty will choose my name... hehe! Sprinkle lots of catnip on me! I hope you have a spooktacular Halloween! It's almost here! I did enjoy my witches brew! Thank you for your hospitality! Please swing your broom by my place for more treats if you haven't flown in already! Have a Happy All Hallows night. Happy Halloween and Happy Blogiversary early. What a festive blog you have here. What a fun post and your graphics are amazing. Love all your sparkle on your blog, Thanks for stopping by my halloween party as well! Lovely blog you've got going here. It's making me starry eyed! Thanks so much for stopping by my blog! Great Halloween post and blog! Happy Halloween to you! Thanks for coming to my party and leaving a link to yours! I love your recipe, yum yum! Happy Halloween and Happy Early Blogaversary! my broomstick is still winging its way thru blogland. glad you invited us in. had a fun time visiting! the brew was delicious. have a Happy Haunting HALLOWEEN! SOOOO happy to see a fun post from you! I am wishing you a super spooky and fun Halloween celebration! And tell that precious kitty of yours to toss some extra catnip on my name...purr, purr. p.s. please enter me in your giveaway if I'm not too late! Happy Blogaversary Lyndy ...what a wonderful Party you have put together... I will have a cup of the 'Monsterous Punch' sounds YUMMY! May the rest of your season be filled with spirited Magic and hauntingly Good Times.. I love the design of your blog. I'm afollower! Love it!! Especially the green cat!! Thanks for stopping by mine, I think I missed the idea of "party" but there's always next year. Still partying well into the next day. Wow, cool giveaway. Thanks for stopping by, I'm trying to make the rounds. Happy Haunting! Thanks for stopping by my blog and leaving such nice comments. Your blog is wonderful and I just love the witch with the cauldron, very cool! OH HELLO~ Hope Im not late. The Zombies kept me. What wonderful decorations. The purple stars is just what I need! Thank you for inviting me. Oh look, Dracula wants to tango! Miss Lyndy, almost two years of blogging, yipppeee yay!! Thank you for joining the festivities!!! Wonderful blog as I am stuck in the 70's and I can't wait to try that brew;0 Thanks 4 sharing! If you haven't stopped for a visit, hop on your broom and come to my party! I'm a late party-goer. I had to leave Vanessa's early--had to go to work, but I'm back today trying to catch up! Thanks for stopping by my blog. Yours is quite interesting and I love that recipe! Love it when you share your recipes! Thanks so much for dropping by and inviting me over. Do you have pics of your collection posted somewhere? I would love to see it! Hope you are having a blessed fall. It's a mixed bag here in the northland! How kind of you to invite my to your lovely Halloween party. I did so have a wonderful time! I am anxious to whip up a batch of your Witches' Party Brew immediately. The Embalming Juice is getting so ordinary, don't you know. Please accept my humble apologies for joining your party so late. You see... I was traveling home from New York on Saturday and had no computer access. Now I'm playing catch-up and visiting all of Vanessa's wonderful parties. Thank you so much for flying over to Casa Hice on your broomstick and leaving your little petite witchy footprints on my welcome mat. I hope you will come again, as the door is always open. And now, I must away and subscribe to your enchanting blog with haste! I want to thank you all for flying by & partaking in my first Annual Halloween Party Extravaganza & Giveaway. I'm still having bewitching fun & I'm glad you all had a magical time too. I hope everyone will continue to come & sit a spell with me & all my familiars whenever you need a little fantasy flight. It's my two year Blogoversary today, so I'm still flying high with my black cat Magick. He can't wait for me to sprinkle catnip on all the entries so he can pick the winner of the giveaway, he so loves his Chat Noir Catnip. But he'll have to wait until All Hallows' Eve after the stroke of midnight. 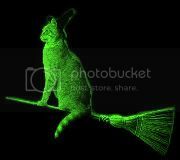 Have a wonderful touring flight & remember don't drink & fly unless you have a designated besom black cat familiar flyer. They're all the rage these days for every spirits safety! Happy Happy Blogoversary 2 you as well Lyndy! Hi Chris, thank you for always being the first to show some love & best wishes. We've come a long way baby since we first started blogging. I definitely learned how to use blog jargon to enter data & summarize, analyze or otherwise convert data into usable information. Wow, you would think I'm a genius on Hyper Text Markup Language (HTML), but really I get by on trial & error. It's been a lot of hard work, little to zero sleep & dreams of Java Scripting, LOL!!! 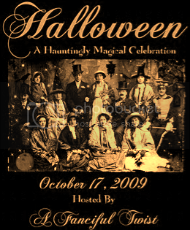 Hi Lady Lyndy, TERRIFIC Halloween Party & Giveaway. FANTASTIC special effects. I'm a big Munsters fan. I see on your Vendio Gallery listings several other Munsters promo PCs. Do you know if those PCs are the complete set? Happy 2 Year Blogoversary too. I subscribed last year, I don't have a blog so I can't sign up to follow you or I would. (Tell your black cat Magick I have a black cat named Albus Dumbledore). Hi Mark & Happy Halloween!!! Thank you for your nice comments. I believe that is the complete Munsters Postcard Set... There were a few different sets back in the 60s & through the 80s, including the black & white ones. Those generally sell upwards to $200 - $300 per Mint set. Have A Hauntingly Fun & A Wonderful Halloween Everyone!! !